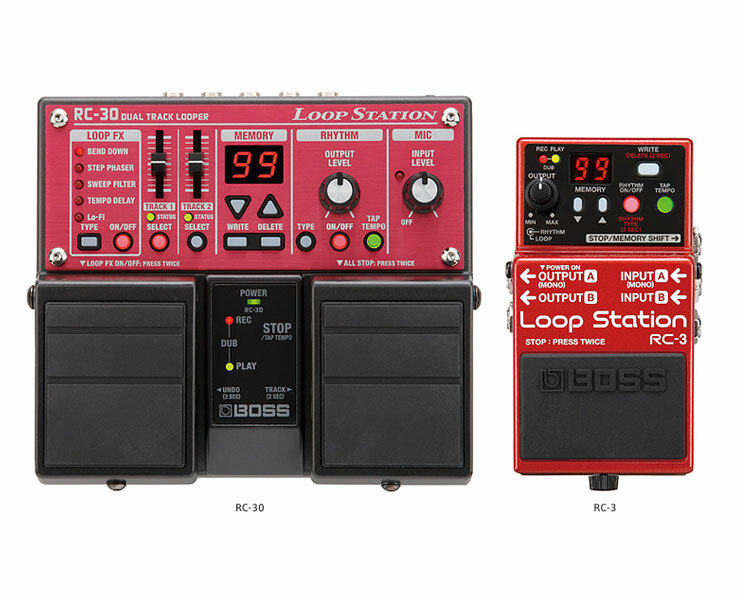 Although I already have both the Boss RC-50 and RC-300 Lopp Station Pedal Boards, I couldn’t pass up on an excellent deal involving a Boss RC-30 and RC-3 combo package. Some guy brought in both to the store a second hand Boss RC-3 and RC-30. The sales clerk asked if I was interested and I responded quickly when I found the price to be too good to pass up. These things are kind of expensive and honestly I think he got them mixed up with the RC-20 and RC-2 combo because he pretty much sold them near the same price as those used. I’m very happy with getting a great deal on these. Today I hooked up the Boss RC-3 to my Roland D-50 and had quite a bit of fun with it. How I use the Boss RC-3 with synths is perhaps different than others. With the Boss RC-3, I transfer about ten 8 bar drum loop WAVs to memory slots 1 to 10. I then choose one and loop over the 8 bar groove. I then save the loop to a “DIFFERENT” slot so that I can then reuse the original drum loop again. For example, I copy a drum loop WAV file created in Audacity to memory slot #1. I then perform my overdubs and jam over the finished loop using the D-50. I then save the loop to memory slot #11. That way I have a finished loop in slot #11 and the original drum loop still intact at slot #1. This method kind of gives me 10 new drum grooves to work with instead of the factory drums in the internal memory which I don’t particularly care for. I also don’t mind being locked into an 8 bar groove in this example because that’s what I usually do anyway with creating a loop. Actually when using the Boss RC-3 or RC-30 I record both the A and B sections in one loop. I’m not a big fan of loop redundancy. I think if people were to create their loops a little longer it would be a bit more interesting, but that’s just me. Note that when transferring WAV files to the Boss RC-3 there is a drop in volume. There are a lot of complaints about this around the web. The solution is to lower the volume in Audacity or your favorite audio editor. You’ll have to experiment with this but I found -20db to be about right for my particular WAV loops. When I transfer WAV files to my Boss RC-50 I don’t have to lower the volume at all, so clearly the Boss RC-3 has changed. In addition, you get latency when changing loop phrases. This is also well known and in my opinion quite deliberate of Boss Japan. I’ve been in Japan now for 19 years and can tell you the thought process coincides quite clearly with the decision to add latency to the RC-3. It doesn’t surprise me the RC-3 has such limitations and I highly doubt a firmware upgrade will fix it. If Boss Japan does decide to fix it, then be on the look out for a Boss RC-4. That seems much more realistic than a firmware update in my mind. Anyways, the Boss RC-3 also works fantastic as an addon to the Boss RC-50 and RC-300 for use as a “free mode” looping device. I put the Boss RC-3 and RC-30 “BEFORE” the RC-50. I always use the RC-50 and RC-300 in Single mode so that I can easily record a Verse, Chorus, and Bridge or Vamp for synth songs. I use drum WAV files of predetermined lengths in loop 1, 2, and 3 on the RC-50. I then use a blank silent drum WAV for the RC-3 or RC-30 that matches the tempo and length of the files in the RC-50. When I now stomp on the RC-3 I can record a loop that will sync for 4 to 5 cycles of the RC-50. This allows me to add some color or flavor to the mix temporarily. The free mode effect allows slight shifting which lends to an interesting analog feel. I don’t play ambient stuff, but rather straight forward rock, synthpop, and up tempo oriented songs In most cases I don’t detect any drifting. Again that is due to use the RC-3 and RC-30 loops working in short cycles and not for the during of a song. 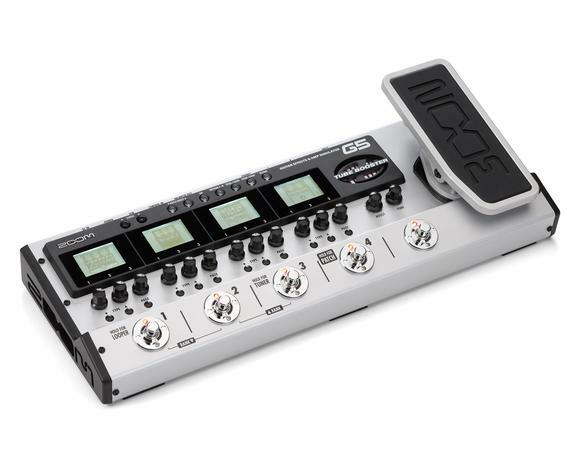 This brilliantly extends the RC-50 or RC-300 with more looping options which is awesome. Also note that with the RC-30, the effects on board are more useful because you can use the dive effect in like a one shot mode over the RC-50 composition. It’s all hard to visualize perhaps so I might do a video here shortly of how I loop. Other loopers I have here are the Lexicon Jamman, Gibson Echoplex, and the Digitech Jamman Solo. I use them all, but nowadays I primarily use the Boss looper stuff. I thought about getting a Boomerang III, but with no midi sync nor the ability to save loops it was quickly scratched off my list. As a synth player, midi and the ability to store my sketches are very important to me. Indeed the Boomerang III is probably the best by most, but without midi and loop storage it’s definitely not a good looper for what I do, although I do have my eye on it in case things change. Originally I bought the Jamman and Echoplex for the fantastic midi capabilities. The newer Jamman Solo had the first significant loop storage ability. The Boos RC-50 and RC-300 loopers I have found suit me well for synth looping. I really like them. Now adding the Boss RC-3 and RC-30 allows a lot of expansion possibilities and additional fun. If you haven’t tried looping check them out! I sure wish these loopers were around when I was a kid in the 80’s. It’s been a busy month so I haven’t had a chance to post some new articles, but I have quite a few on deck this month. Hopefully I’ll be able to catch up. It was an excellent September month for picking up old used gear. Today I present a stomp box that I actually bought new. It’s the Zoom MS-50G and right on the box it says for guitar. I wondered if I would need a DI, but it actually works great with all of my synths. So plugging the Zoom MS-50G right into the synth direct will work just fine. I am a huge fan of the recently released Zoom G3 and G5 pedal boards. I have them both and use them all the time with my synths and of course guitars. I really like how easy they are easy to program and of course I like the sound of them. 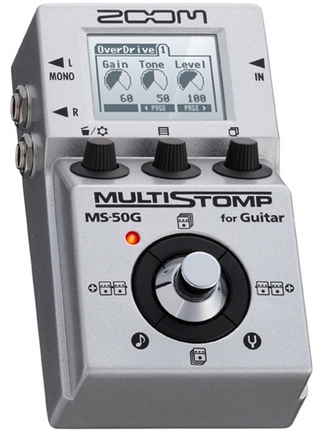 The Zoom MS-50G is no different in that “if correct” it uses the same chip as the G3 and G5. It’s sounds great and as you can see it has a very small footprint. Right now I have it plugged into my newly acquired Roland EP-30 and it’s absolutely wonderful. There are many patches which can contain up to six different effects. Yes, there are default factory patches, but you can also modify or create your own. Each of the three knobs on the front can dial in specific parameters. Plus there are four scroll buttons surrounding the toggle switch for scrolling through effects that have more than one menu. It’s super easy and for those who have the G3 or G5 it’s nearly identical. There is no looper on board, but that’s no problem for me given that the G3 and G5 have loopers. The Zoom MS-50G sits nicely up on any of my keyboards and works great at adding additional effects when needed. It’s simply awesome to be able to scroll through different effects quickly and experiment with them on the fly. As many will know, old keyboards don’t necessarily have a lot of effects on board and this Zoom MS-50G becomes a nice addition. If you need to add effects to your synths or keyboards on the go or for just easy experimentation, you can’t go wrong with the Zoom MS-50G. It’s super small and easy to setup. It will add a lot of fun to any synth lacking in the effects department. It you get a whole lot of bang for your buck with this little gem. Here is a quick clip of the Zoom MS-50G in action on the guitar. I suppose I’ll have to try and record one with a keyboard setup as I don’t see any on Youtube yet.